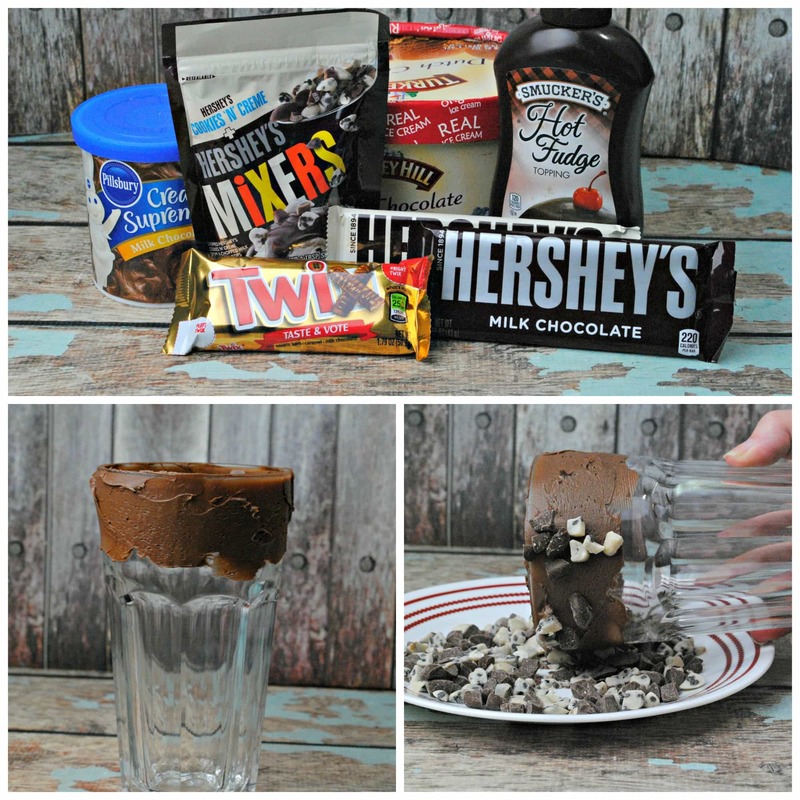 Lady and the Blog → Living → Featured → Hershey’s Chocolate Bar Milkshake Recipe: A Total Splurge! Ok folks!! This one is IT. The shake that your children’s children will be talking about. THE memory of the summer. The treat that future songs will be written about. Should you make this more than once? Absolutely not. This shake should feel like a Big Foot sighting — happens once in your lifetime and friends don’t believe your story when you retell it. You want a calorie count? You want a calorie count? Forgettabout’it. You don’t need that kind of hate coming from me. This is a true indulgence and it’s just for fun. 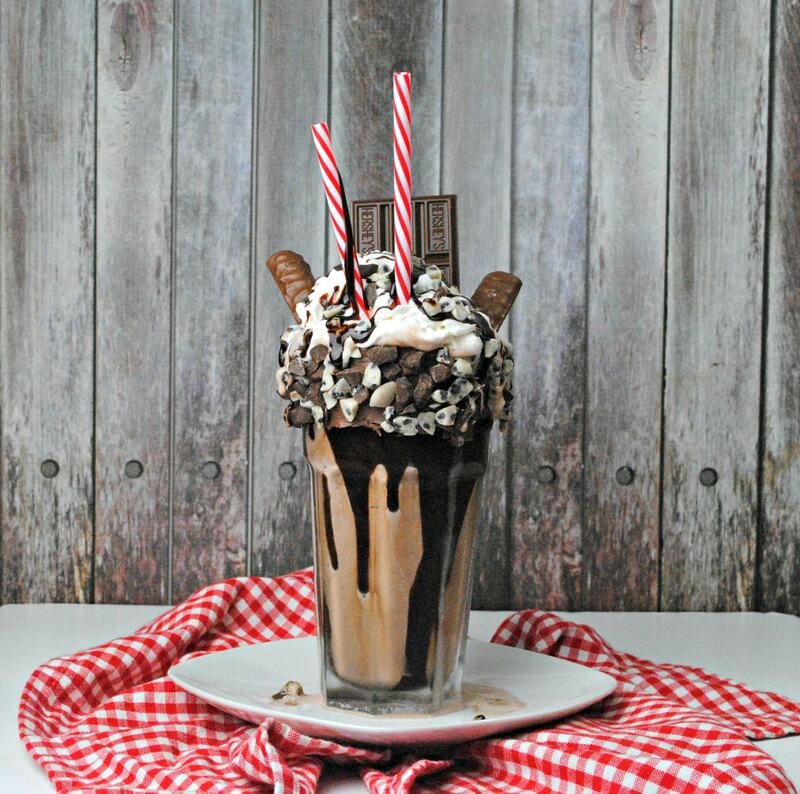 The Hershey’s Chocolate Bar Milkshake will be everything that you’ve ever wanted and more. So, take slow bites and embrace every flavor!! But don’t start any of that before snapping a photo for Instagram because LOOK AT HOW PRETTY IT IS!!! Ready to hear how to put together the Hershey’s Chocolate Bar Milkshake Recipe? It’s actually quite easy! 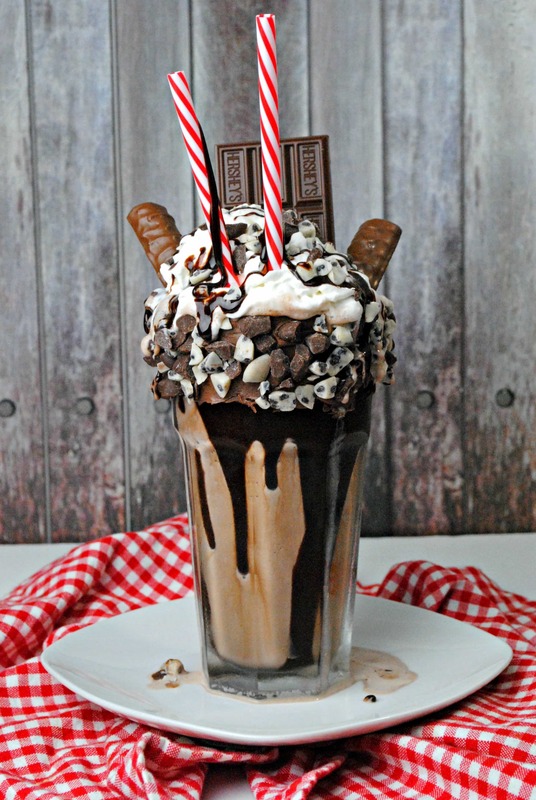 Using a milkshake machine or a blender, add in the ice cream and milk and blend until smooth. Place into freezer while you prep the glass. Using the chocolate frosting, take a knife or your finger, and coat the outer rim of the glass in frosting. Roll glass in the Hershey candy mix. Using the chocolate fudge, drizzle the inside of the glass and then add in the chocolate ice cream. Top with whip cream and the candy. Drizzle with chocolate fudge and enjoy.